Leading Exporter of designer black front cut ladies suit for diwali, designer patiala suits, designer embroidered patiala suit, mirror work maroon green patiala suit, designer heavy anarkali suit and designer heavy suit for ladies from Delhi. Designer Black Front Cut Ladies Suit For Diwali with Heavy Dupatta, Beautiful Embroidery on Neck, Silk Fabric Suit. 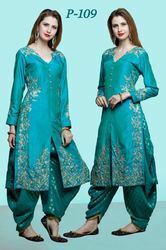 Designer Patiala Suits With Heavy Ston Work on Neck and Flair Of Kurti, Silk Kurti, Brocade Salwar and Net Dupatta With Brocade Broder. Mirror Work Maroon Patiala Green Suit with Front and Back Neck Mirror Work. 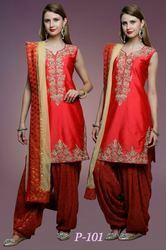 Georgette Top and Brocade Salwar with Beautiful Brocade Border Georgette Dupatta. 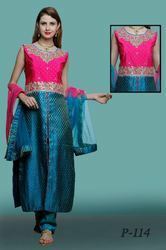 Designer Heavy Suit With Stone Work , Full Sleeve Silk Kurti With Brocade Dhoti Salwar. Designer Anarkali Suit for Ladies in Navvy Blue Shade, Embroidery on the waist of the Anarkali Suit. Exclusive Designer Suits Latest Collection 2017 in 38,40,42,44 Sizes, Brocade Kurti with Stone Work on Neckline and Dupian Pants with Two Sided Bodered Net Dupatta. Designer Pretty Heavy Anarkali Suit with Heavy Stone Work on Neck and Thread work on Flair. 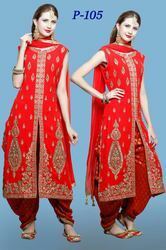 Designer Beautiful Party Wear Suits Achkan Style With Dhoti Salwar, Heavy Stone Work on Kurti (Full Embroidered). 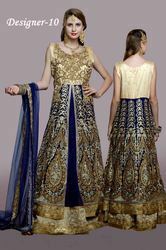 Golden And Blue Anarkali Suits For Ladies in size 40,42. 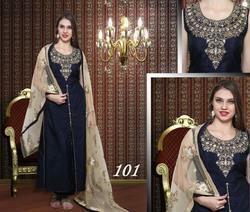 Heavy Designer Suit in Golden Thread Embroidery on Golden Net and Blue Net inner Side. 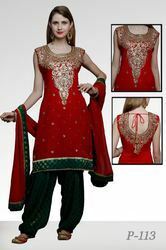 Designer Heavy Suits For Ladies in Size 38,40,42,44. Stone Embroidered Silk Kurti with Brocade Plazo and Four Sided Net Dupatta. Exclusive Beautiful Front Cut Suit in Royal Blue Shade, Thread Embroidered Silk Suit.